The Scott Residences is under construction on the corner of Scott and Wells Streets in Chicago’s Old Town. The six-story, 120,000 SF mixed-use building will house 71 apartments, structured parking and 10,000 SF of ground-level retail space. Extensive amenities will include a club room, fitness center, billiards room and roof terraces with views of the Chicago skyline. 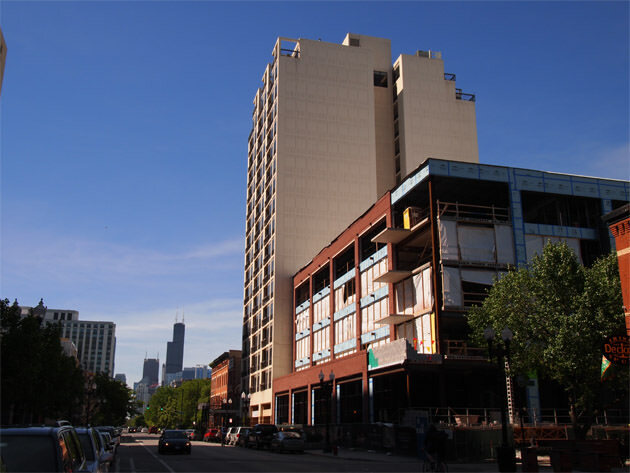 The project marks the second collaboration of co-developers JDL Development and Harlem Irving Companies and Hartshorne Plunkard Architecture, which successfully delivered Halsted Flats at 3750 N. Halsted in Spring 2014. Located at 211 W. Scott Street, The Scott Residences adds density and a street presence to a well-trafficked corner of Old Town. Retail storefronts line active and vibrant Wells Street. The masonry facade complements the architectural vernacular of neighboring Victorian-era buildings. Inside, HPA designed an interior concept that blends early 20th Century motifs with a contemporary twist. Period details include vintage light fixtures, reclaimed wood and a repurposed fireplace. The energy-efficient building features include a green roof, a high-performing building envelope, and a state of the art mechanical system. Pre-leasing sales have begun, and the project is scheduled to open in Fall 2014.